Cats, dogs, pets—we love them all and we want them to be happy. It's no secrets that cats are home bodies, so we have to make sure they're happy. As all cat lovers will tell you: it's a cat's world, we just live in it. 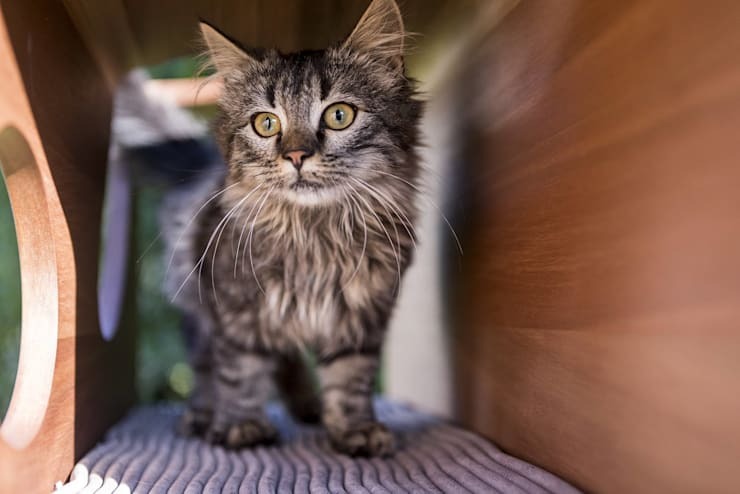 Well if that is true, then you had better do your utmost to ensure your living space (whether it’s a fifth-floor apartment or double-volume house) is as comfortable and fun for your kitty as possible – but also as safe. As cute as kittens and cats are, keeping one comes with certain creative thinking, like keeping them from wreaking havoc on your clothes and furniture. Fortunately, there are many ways to cat-proof your home so that you and your feline friend can live in peace and harmony together. So, herewith the homify way to safeguard your possessions, but also keep your cat alive and happy! Your cat has claws, and she loves to use them. And she doesn’t understand this problem you have with her trying out her scratching abilities on your furniture. So, rather provide more appropriate scratching places for her by getting a scratching board at a pet store; some are made from cardboard, which can work just as well. The more active your cat is, the more she’ll appreciate that scratching post. Instead of (or shall we say in addition to) getting a scratching post, wrap some rope around other areas you know might lure those little claws into coming out, like around chair- and table legs. homify hint: Cats shed. That’s a fact of life. While you can't stop this, you can find covers for your furniture. They may not be the most stylish option, but you can just pull them off when company arrives. Plus, you can wash them periodically instead of every day. Is there an old cardboard box around your house (like for shoes or the one your new microwave came in) that you need to get rid of? Don’t. Rather present them to Kitty as his new playpen. Cats adore boxes, and this also presents prime space for him to work on those clawing- and scratching abilities without sending you over the edge. Litter tray odour can be the toughest part of sharing your home with a cat. Even if it doesn’t bother you, it can be quite embarrassing having company over who remark about that “cat smell”. Our advice? Scoop out that litter box early and often. Replace the litter at least twice a week. Wash the box with soap and warm water every time you do so, but don’t use ammonia-based cleaners, as that can make the smell worse. Sprinkling a little deodorizer, like baking soda or green tea leaves, over that litter box every time you scoop it out can also help. Many cats will avoid a heavily-scented space, so ensure to use something that both you and your cat will like (or that’s unscented). 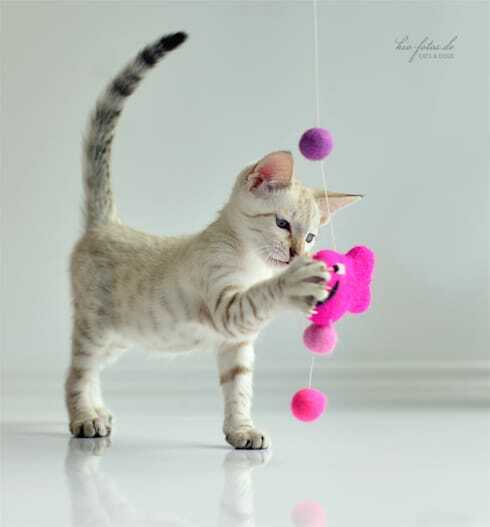 Any string, whether it’s loose-hanging or connected to your flat-screen television, is bound to be enticing to your cat. However, playing the way cats do can result in her getting all tangled up, or even strangling herself. And electronic cords also pose other obvious risks if chewed on. If you can’t hide those cords or tie them up high, rather wrap them up in cheap plastic tubing that can withstand that nibbling. 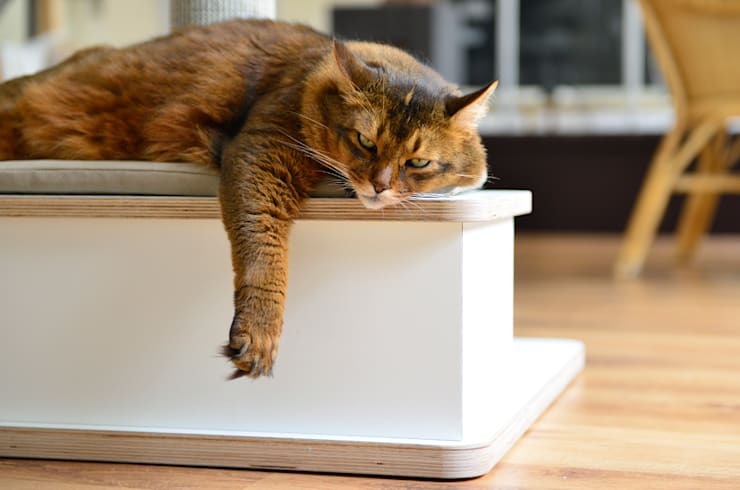 homify hint: Cats primarily chew because they’re bored, especially if left alone all day. So, stock up on “play-alone” toys like wall-mounted mice, or arrange some simple cardboard boxes into a tunnel with cut-in holes. You may be a homebody, but your cat definitely has an interest in what goes on outside. That is why a sunny window always attracts Kitty, as it is a hotspot for perching in comfort while taking in the exterior scenery. However, it can be difficult for a cat to perch comfortably on a narrow windowsill. We suggest spoiling Kitty with a comfortable perch for her napping and window-watching time. These perch spots, which can be bought at pet stores or ordered online, easily snap together and adjust to any windowsill using provided hooks and loop fasteners (screws are provided for more permanent attachments). Alternatively, place an old tray (or drawer) with a comfy cushion in the window frame and keep it in place by using tension rods (used for hanging curtains). Just be sure to test if it’s sturdy enough to hold Kitty’s weight. 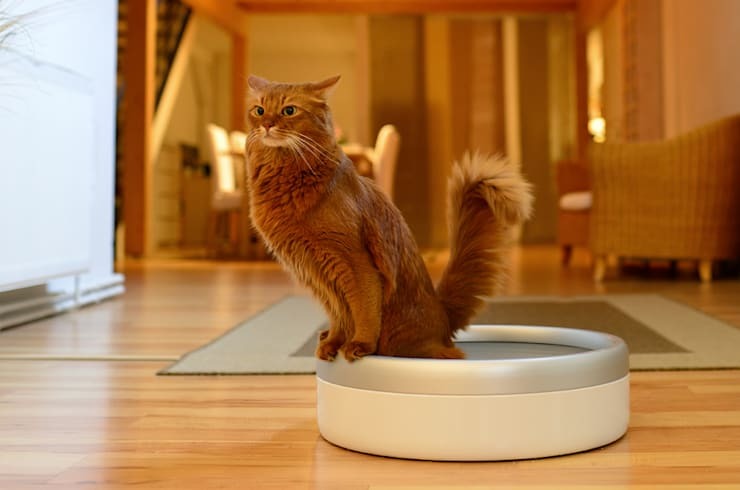 homify hint: Cats, especially kittens, can drown in a small amount of water, including your toilet bowl. And as older cats may want to drink from that not-too-clean bowl, it’s best to just leave the lid down all the time. We know that Kitty loves to explore, and he shouldn’t be denied a little fresh air every now and again. But if that fresh air is available on your fifth-floor balcony, you may feel a little nervous about letting him outside. 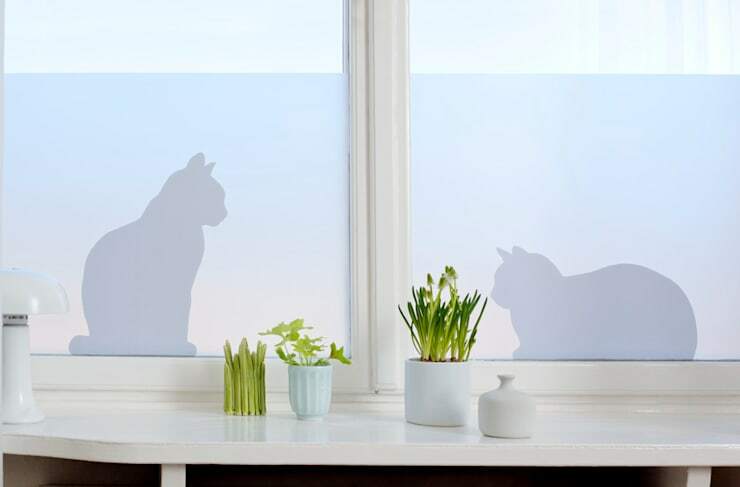 Rather stick some transparent vinyl sheets or plastic panels against those balustrades/railings to keep Kitty safe. Or place wire above the railings if there’s a chance he might attempt jumping over it. Placing a snug cushion and creating a shady area on the balcony will make it a perfect spot for your cat to enjoy, sans the possibility of him crawling through those railings. 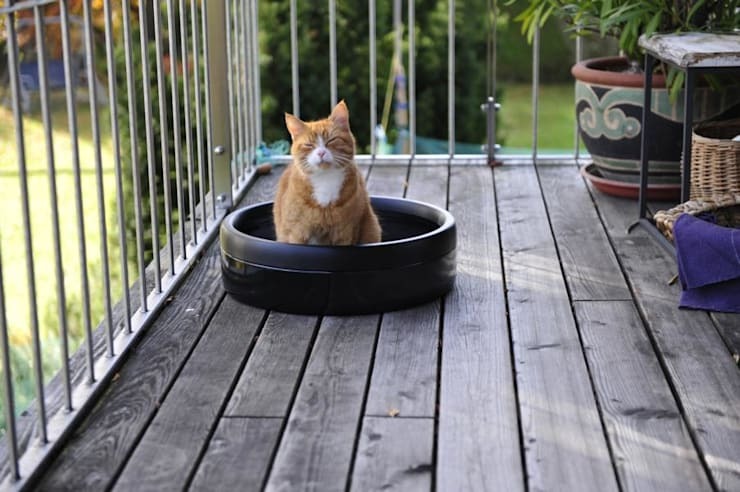 Of course your cat is not the only one who wants to enjoy a stylish balcony. Let’s help you Take your balcony to new heights. Your cat loves to jump, climb and crawl, and not always on the floor. If there’s an open spot on that cupboard of shelf, you can be sure she’ll attempt to reach it. Rather leave some empty space on a few shelves or bookcases that can accommodate Kitty’s perching presence. This can also be a great reminder for you not to clutter your bookcase with books and ornaments. homify hint: What is beautiful to you may be deadly to your cat. Many plants are poisonous to cats, so please ensure your foliage don't interrupt with Kitty's love for life. Some common plants that are poisonous include: Aloe Vera, Amaryllis, Azaleas and Rhododendrons, English Ivy, Lilies, Tulip and Narcissus bulbs, and many types of ferns and ivies. Rather ask your vet or nursery if you’re unsure about a particular plant/flower. Be sure to check out these fabulous climbing posts by Stylecats®. Did our tips work? Is your cat as happy as can be? Please tell us if you have any other hints to ensure a happy housecat.